Diseases of the guttural pouches are not common, but can be life-threatening and very difficult to treat. The guttural pouches are unique to a small number of animal species, including the horse. They are sacs of air that expand from the Eustachian tube, with one on each side of the horse’s head. They are positioned beneath the ear and each guttural pouch cavity in an adult horse can hold as much as a coffee mug. The guttural pouches are lined with a very thin membrane and beneath that membrane are some critical structures, such as major arteries to the head and some of the most important nerves in the body. Most of these nerves are cranial nerves, so when they are damaged, the resulting clinical signs relate to functions of the head. Examples would be problems with swallowing food and water, breathing, facial expression and head posture. 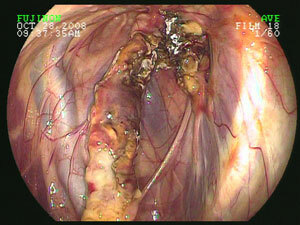 The most common disease of the guttural pouches is called guttural pouch empyema. This is caused by a bacterial infection, usually secondary to strangles. In this disease, the thin lining of the guttural pouch becomes inflamed and the guttural pouch becomes filled with thick pus. This material can drain through the Eustachian tube opening into the pharynx, and from there to the nasal passages and out the nostril. These horses in general do not feel very well, and so they are depressed and have a fever, but damage to nerves is uncommon and to arteries is even rarer. Treatment of choice includes antibiotics, flushing the guttural pouch with a physiologic solution to remove the pus, and analgesic (pain-killing) drugs. In severe cases, the pus might have to be removed by surgical drainage. In rare cases, the pus hardens into round balls called chondroids. These usually have to be removed by surgery. Guttural pouch mycosis is a rare but very serious disease in horses. It is caused by a fungus that infects the lining of the guttural pouch, usually on the roof of the guttural pouch. The infection can cause some deep damage to the arteries and nerves. Unlike empyema, pus does not build up in the guttural pouches and many of these horses can appear quite normal until, quite suddenly, either hemorrhage or cranial nerve damage becomes apparent. In the case of hemorrhage, huge amounts of blood can pour from the nostrils. Bleeding from the nostrils (called epistaxis) can be evident in some cases as extensive painting of the horse’s stall walls and floors with bright red blood. Hemorrhage can be fatal, and so all attempts are made to prevent this. Dr. David Freeman at the University of Florida has pioneered methods for occluding affected arteries in the guttural pouch and has continued this work with our small animal cardiologists so that we currently use minimally invasive, state of the art techniques for this purpose. The success rate of these procedures is very high, provided they are applied before the horse has lost too much blood. The University of Florida has all the necessary equipment to diagnose and treat this serious disease. The nerve damage caused by guttural pouch mycosis is another story. If mild, and affecting certain nerves, the horse might eventually recover. If severe, and especially if affecting the nerves involved with swallowing or with respiration, the chances of recovery are slim. Most affected horses will require intensive nursing and methods of feeding for months before the signs resolve. Again, the veterinarians at the University of Florida are very familiar with these methods and have had success with them. 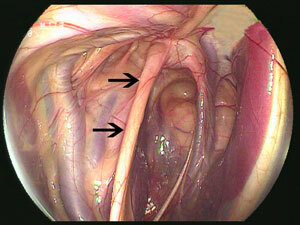 Guttural pouch tympany is a congenital disease of horses, so the signs are usually seen in foals shortly after birth. For reasons that we do not understand, one or both guttural pouches fill with air that cannot escape and becomes trapped. These foals then develop a “chipmunk” appearance caused by air distension of the guttural pouch in the throatlatch. These foals are otherwise in good health, although some might experience difficulty swallowing and this might lead to aspiration of food and milk. Treatment is surgical and involves creating a new opening from the affected guttural pouch so the air can escape from the affected side into the normal side or into the pharynx. A variety of different methods are available and the surgeons at the University of Florida have experience using them. Temporohyoid osteoarthropathy is another rare disease of guttural pouches. This is also caused by an infection, but the infection affects the middle ear of the horse. The middle ear is very close to where the stylohyoid bone forms a joint with the skull on the roof of the guttural pouch. This joint is called the temporohyoid joint. The stylohyoid bone is a long slender bone that runs from the roof of the guttural pouch, down to the base of the tongue, where it joins with the same bone from the other side through a series of connections with smaller bones. The purpose of the boney apparatus thus formed, called the hyoid apparatus, is to support the base of the horse’s tongue and part of the larynx. When the infection in the middle ear invades the nearby temporohyoid joint on the roof of the guttural pouch, the infection causes the joint and the stylohyoid bone to become thick and brittle. Then, through repeated movements of the tongue and larynx, the brittle portions of bone can fracture. As the fracture heals, it will form a callus and this callus can reach sufficient size to put pressure on some nerves that go through the guttural pouch. The nerves most typically affected are the facial nerve, which is involved in the horse’s facial expression, and the vestibulotrochlear nerve, which is responsible for balance. When these nerves are affected, the horse will have a droop in its ear, eyelid, and muzzle on the affected side and will even have some signs of incoordination and a head tilt. If the condition is mild, it can be treated with antibiotics. In more chronic and less responsive cases, a piece of bone from the hyoid apparatus is removed on the affected side and this essentially detaches the stylohyoid bone from its connections with the tongue and larynx. Then, movement of tongue and larynx do not affect the diseased stylohyoid bone so that it can heal without any risk of further fracture and additional callus formation. The nerve signs can completely resolve or partly resolve, although in severe cases, they can persist. The University of Florida has the expertise, experience, and the equipment to diagnose and treat this disease. Other diseases of the guttural pouch are very rare but can occur and these include cysts and tumors.